It is the election special which only gives us the politicians claiming either a real, a moral or an imaginary victory...followed by a quick Lee Rigby question. What do you think the 1st, 2nd, 3rd places will be for the Euro elections. And the vote share percentage. Current polling has UKIP or Labour as the leader, on around 26-27%, with Tories third on 22-23% and Liberals/Greens nowhere of note. So your guesses into the comments plus, optional, how did you vote ? And of course I voted loyally with the party. voted for Conservatives by post a few weeks ago..with the usual reservations. Point of order. They can only discuss the local results, the Euro's are not announced until the continent has voted. 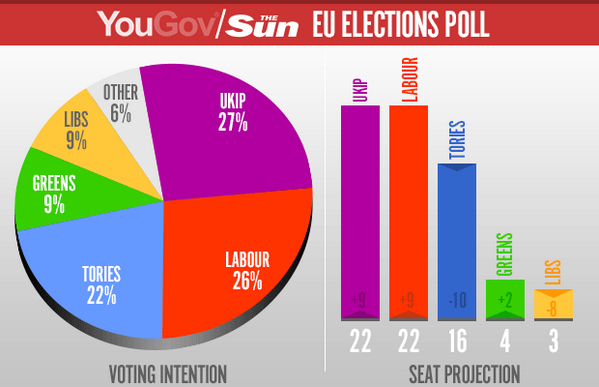 but Labour will get more seats than UKIP. 1) Ukip - does racist mean racist anymore? 5) To beard or not? Apathy and antagonism - priceless! However. All those imitation UKIP parties ? I think the analysts ought to count their anti-EU votes together and present them as one to the main parties to give the levels of Euroscepticism. Perhaps add them to the Conservative party's too seeing has Cameron has pledged a referendum. As for which party I voted for ? Which do you think ? Too early to say but UKIP seem to have done even better than expected. Some strange Labour losses in old red areas. The Question Time itself wasn't too bad. Did the mandatory 'does voting UKIP mean you are a racist' and then became a normal show. Two Labour on the panel which BBC haven't done for a while. I had to turn off QT. The 'audience' groaned when someone dared to mention that 210,000 new arrivals might be having an effect on the costs/shortages of housing. Perhaps it's me that's mad. And that the number of people in a country has absolutely nothing to do with the cost of housing. I rarely watch QT. The audience seems to always be packed with people who are leftist. Perhaps we are now a leftist country. Alas I don't think so. In the real world my opinion on things is pretty standard I think.